The readathon was this weekend, and while I sadly AGAIN COULD NOT PARTICIPATE (remember that one time I could, but I was still out of town at my parents', so I really just read Winnie the Pooh and went out to lunch? ), it was because I was in Milwaukee with my very awesome internet friend Kory, seeing Rachel Maddow be amazing. Speaking very briefly of internet friends, are they not swell? I think I've had like two awkward experiences of real life encounters with them out of a zillion (if you grew up on Livejournal, you eventually meet basically everyone on your friends list, or "flist" as the cool kids called it). 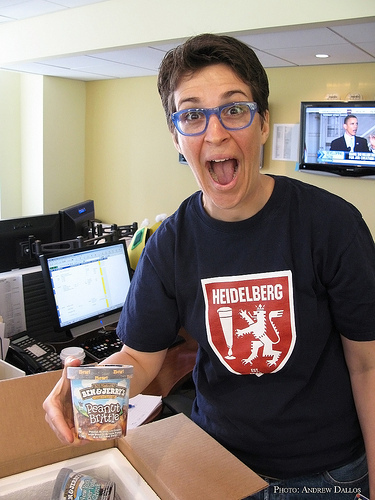 With Maddow, you see her show and perhaps think, 'Surely her articulate wittiness is the result of a teleprompter.' BUT NO. She was off-the-cuff hilarious, and used 'morass' in a throwaway sentence, which I died over but by which my mother (whom I told later) refused to be impressed ("People I know use that word all the time" -- no, they don't, Mom). The tickets came with a copy of her book, which is something I would probably otherwise avoid reading, despite my Maddow love. I read about things that took place in 1915 or earlier. If there are no fun hats, I am not on board. HOWEVER. After hearing Maddow speak about the issues in her book (mainly how disconnected the military has become from the American people and how it has been made easier to start wars in recent times, as opposed to harder), I am reading Drift with alacrity. And it's interesting. It's engaging, and despite some re-reading of phrases like "chairman of the Senate Armed Services Committee," it's easy to follow. And she talks about military contractors! Which is something actually worth reading about! I feel like if you watch her talk about it, it's way more persuasive than what I can say. Espeeeecially since I'm only like 20 pages in. Also Jon Stewart! Hilarity! Irish setter impressions! Addressing the subject line, if Maddow were my neighbor, she would take her of course ample free time and have cocktail parties and we would all go to plays and borrow sugar from each other and OH, the '50sness of it all.